One of the benefits of doing my own blog is that every so often I can share things with all of you that are personally special. Today, it’s something that just happened with my seven-year-old son. 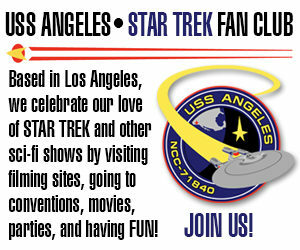 Longtime readers of Fan Film Factor know that I’m bringing him up with a proper appreciation of Star Trek. Sure, if given the choice, he’ll watch Star Wars first. But the kid loves Star Trek, too, I and love sharing it with him. For the last few years, our Star Trek “routine” has been to watch half an episode or so while I do cardio, just before my little cadet’s bedtime. We’re watching everything in the order it debuted. We watched all 79 (well, 80 with “The Cage”) episodes of TOS, then all the animateds. Then we went through TOS again ’cause I felt he’d appreciate it more now that he was older. Then we did the first four motion pictures in order. And just a couple of months ago, we started on Next Gen.
Keep in mind, for what I’m about to tell you, that my son has pretty much seen nothing of TNG, and certainly not Star Trek Generations. All he knows of the Enterprise-D crew so far is what he’s seen in the first ten episodes. 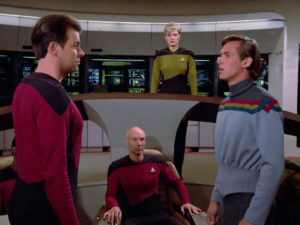 And so it was that we were watching “Hide and Q” and got to the scene where Riker grants the deepest wishes of his friends. Wesley ages up to an adult. Geordi is given his sight. Worf gets a horny Klingon woman. Wow. As I said, my son has never seen Generations. But somehow he knew that this was Picard’s deepest wish. Lucky guess? Perhaps. But either way, I’m writing this blog today to show to him in a couple more years when he gets older and we finally watch the seventh Trek film and see Jean-Luc Picard get his deepest wish—a family with kids—inside the Nexus. Thanks for letting me share this moment with you. And I thank my little guy for fulfilling my deepest wish.